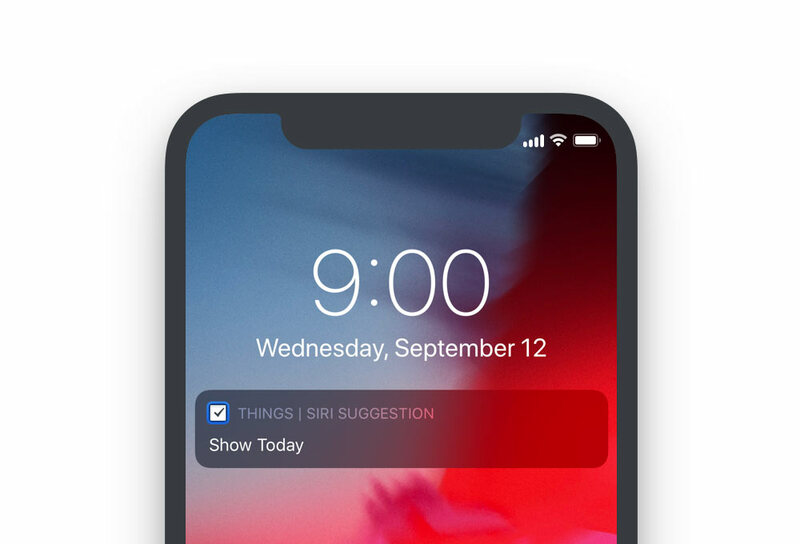 Here's how Siri suggestions work on iOS 12 and which information you can expect to see there. Siri can learn your routines and begin suggesting things that you might want to do. This functionality is controlled by iOS, and will enable Siri to provide you with shortcuts to actions you do often, or at a particular time of day. These suggestions will appear in Search, Settings, or on your Lock screen. For example, if you open your Today list every morning around 9 AM to look over your to-dos, Siri will eventually pick up on this – and the next morning at 9, you might be greeted with a new “Show Today” shortcut right on your Lock screen. Tap the shortcut, and you're instantly brought to the right place within Things. When you are looking at any of the default lists, like Inbox, Today, Upcoming, or Someday. When you create a new to-do via the + button. When you use Quick Entry. Additionally, if you speak to Siri to create a new to-do, Siri will automatically add that to its list of suggestions, so you might see it appear again later. On your iOS device, go to Settings > Siri & Search > Things. Disable Search, Suggestions & Shortcuts.